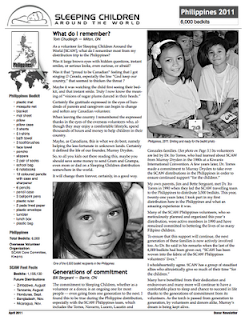 The donor newsletter for the Philippines bedkit distribution has gone to print and can be downloaded from the Sleeping Children Website. Photos are available in the Philippines 2011 Photo Album. You can view them by clicking the link above. 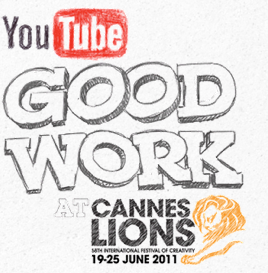 Back in March, YouTube set up the Good Work Channel on their website and invited non-profits around the world to tell creative agencies about their group. Sleeping Children Around the World was among 436 groups that submitted briefs and, in response, 268 agencies replied to the briefs. Two of them were for our charity. To put this in perspective, only one-third of the briefs got a response at all -- some only received one response and the most popular received 58 responses. I've posted Sleeping Children's two spots below. One came from Budapest, Hungary and the other from Cape Town, South Africa. Please help by liking/voting for our two spots. We've also posted them on the SCAW website. You must click on the YouTube icon below each video to vote.